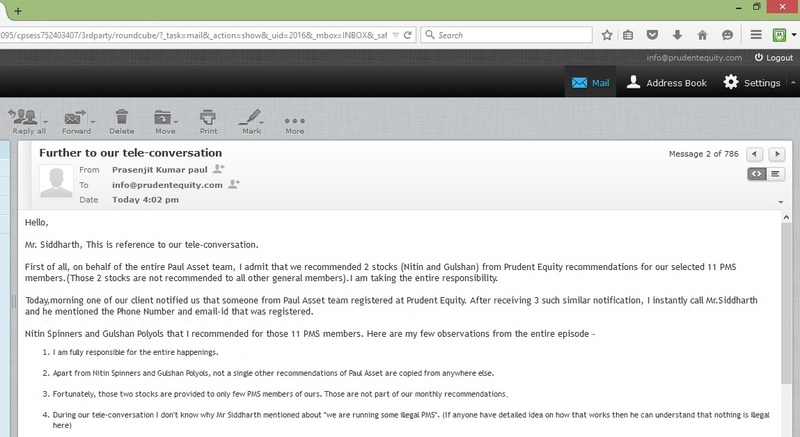 Discussion in 'Stock Advisory Services' started by Shrikant Rane, Apr 23, 2015. I am a member for 2 years now. It depends on stocks. Most go up but sometimes it also takes few months. I think you are referring to their newly launched section called value picks. They have already mentioned that those stocks are multibaggers. I don't know which stocks you have bought but 2 are up 70-80%, 4 are up 40% and one is up only 15%. If you are getting 25% then you must have bought it lower because I bought at recommended price only. 1 has already been sold. Basically they have 96-97% success rates. I am not surprised with the way these stocks just shot up in just 2-3 months. Prudent Equity is by far the best stock advisory in the country. No doubt. I am very tempted to try. Do you know if there is trial offer? balram and Kumar like this. Nopes. They don't offer trials. They informed me that returns from one single stock is enough to recover subscription cost....which now I find is true. Thanks for that. I think once the market carnage is over, I will subscribe. Things are very shaky just now and it is dangerous to put new money in market. ramesh516390 and Kumar like this. are the recommendation given during market hours or after it closes. if i subscribe, do i get BOTH value picks and stock recommendation for 20000/-? Ya...we get stock recommendation, value picks, long term, stock queries all in one package. did you buy Premco Global ? if yes, how? it hit circuit for next 8 days. so my question - how am i suppose to buy a stock at recommended price. I don't know about Kumar but I was able to buy Premco at 203. They told me 10% upside is always factored in while recommendng. 2nd day it was not on circuit. In fact, 5 of the value picks were below cost till march. they are now up 20-80%. kong ben, one can buy easily. I did. Like shrikant said, some margin is given while they ask us to buy. I bought Premco at 199. This issue is not an issue here at all. If a stock is expected to double or triple, how does it matter that you buy at 190 or 199. By the way, i bought all the way till 240. Fulford was recommended at 686 not 823. It hit circuit because foreign promoters made some kind of open offer. I think because of that they raised the rec. price at 823 or it was something like that. I don't remember exactly but I think it was a special situation or something. My name is Shrikant not shrirant. I am Prudent Equity member and I can say they among the top. There is no issue for buying the recommendation at right price. For almost all of the calls you get enough oppurtunities to buy and sell. @KongBen, I would request you to not discuss the calls in public forums. prateek.kackar and Kumar like this. 1. This clearly shows you are not the member. Because if you were you would know that most stocks were there for a month or so before they appreciated by 50-100%. Where do you get such returns? Plummet? Huh...look at the track record on their website. Most of them are higher than sell prices. 2. Business channels are useless. Valuepickrs are themselves learning and coming to conclusion through group discussion. You are totally right. Queries section of Prudent Equity just like its stock picks is VERY VERY USEFUL. 3. Can you tell anyone who generated 60% returns in 2012? Or shall we say 75% compounded annually for 4 years now. Hats off to Prudent Equity where even competitors like Prasanjit **** of *********** registers (and gets caught and is thrown out) to get knowledge and ideas. very right Kumar. All competitors are trying to find how Prudent Equity is generating mind boggling returns. From the queries section of Prudent Equity, here come the proof. good stocks and Kumar like this. I am not saying that you are wrong but there is something that I would like to show you. After seeing this image, I contacted ********* and wanted to know his opinion. I have attached the screenshot of his reply as well as the email that he sent it to you. Now looking at the screenshot that you attached, don't you find any change in it. I am again not saying that ********* is right but won't even agree you. Point to be noted- he made mistake and and he is accepting it. Everyone makes mistake but only few accept it. So, better to forgive him this time but never forget his mistake. As we all know it becomes hard to handle the growing team and the same happened with **********. We hope that he takes strict action against that guy. Anyways, in this whole incident Prudent Equity proved their prudency again. Their picks are not only good they also are mature enough to understand the situation. Thanks everyone, it was my personal view. These clarifications are coming too late. After 7 days or so. Enough time for **** to change the wordings and claim he was less wrong. Now it does not matter. Just because few lines are altered does not lower Pauls guilt. I asked Siddharth and he said " It is like **** saying that he came to my house and stole only my cash and that he should not be accused of stealing the laptop which has also gone missing". How does it matter? A thief is a thief. This makes sense. **** accepted that he copy pasted ideas from Prudent Equity. All his queries in the Stock Queries section of Prudent website came from disguised name of Chaya Mitra (he registered with that name) for Suven Life Sciences, Acrysil, Lumax etc. He was trying to find the merits of these companies from Siddharth. Can you believe this? He has got caught at one place. He must be stealing all the time. But got caught only once. There is always a first time. At least we can see someone who is honestly accepting that few words are altered. Agreed, it does not make **** less guilty. Only one observation from my end. Before that- I am making clear that I am not a subscriber of ********** or any any other firm. However, I was planning to. Whatever these corporate guys do, we are not aware of. What we need is good stock tips. Agree? Now in this competitive world, everyone is stalking their peers. Like **** did for Prudent Equity, similarly Prudent Equity might be stalking someone else(no offence). Even big firms do the same. There is nothing wrong in it. But yes, becoming a copy cat is a wrong thing.. So, lets end this discussion here, because whatever is the result, it is the big guys who are ultimately going to enjoy the party. Their client base will increase even if they cheat or lie. No benefit to us. We just want a honest advisor who can simply promise for a consistent 18% annual return , that's it and nothing else.